The much anticipated Adobe AIR technology version 1.0 was introduced February 25th of this year. 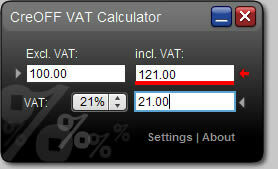 It’s a promising platform and that’s why the CreOFF VAT calculator was rewritten for the Adobe AIR platform. The Adobe AIR version of the CreOFF VAT calculator is based on the calculator widget v1.1 that already existed for the Yahoo widgets platform, and offers almost identical functionality. Visit the download page to download the new widget. VAT widget approved by Yahoo!